According to Wikipedia, sloppy handwriting kills more than 7,000 people annually. Since I don't write prescriptions, I don't need to worry about that - but I do like to write correspondence and typing a letter is sometimes not personal enough. I've tried hand writing letters, but I always seem to misspell something or want to move a sentence after I've finished it. 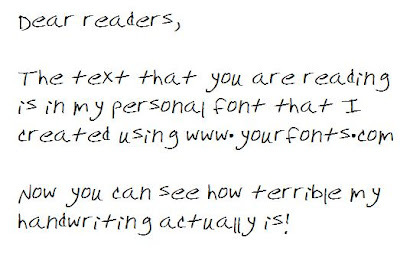 Enter YourFonts.com, where for free, you can create a font out of your own handwriting and have the best of both worlds! Just download their template, complete it, upload it, and you've got your own font.